Web analytics is the technique of measuring and analyzing the data, collection and reporting of data which helps in understanding and optimizing the use of the web. This field is gaining popularity and has many applications. If you are a Web designer then you may already know the importance of being aware of user behavior on your web site. This information is really vital for successfully running any web application. Now a days, more and more analytical tools are offered with real-time tracking and graphical representation of web traffic and site analytics. Piwik is a free open source tool that can be self hosted and easily integrated with any website. It can track the visitors to the website. This is available in 40 languages. This software can be used to create goals and tracking of conversations can be rendered too. The report is produced in real time and the frequency for availing the report can be set as well. It’s probably the most popular analytic tool which has numerous unique features, for example the Getting Started Guide. There are also answers to loads of FAQs which are helpful to the users. It provides the option to analyze the data by segmenting the data, and segmentation gives a better analysis of data. Segmentation can be done on criteria such as age, rates, quantity of messages received or sent. It has advantages such as an easy to install feature which is compatible with any platform. It tracks the number of people, number of visits and events. The data obtained can be processed. Data analysis is instant, as and when received, without the need to wait. It assists in analyzing and tracking people visiting a particular website. This can be used to track a number of websites and access statics either by sight or in aggregate. Specific tracking of visitors is possible with this software also. Kissmetrics is useful in tracking each person visiting your site and not just the percentage or the number of people visiting your site. This helps in retaining customers and increasing the business. Clicky offers real time data analysis, unlike some other software which need time to generate an analysis. The history of data up to one year can be viewed at the click of a button, which is one of the best features of Clicky. 30 days data are offfered by default; however more can be viewed with a click as well. Omniture is an integrated tool which can be used for web analyzing. It is user friendly and can be used even by those who are new to this tool. It can be accessed through iPad, automatic notifications can be set up; indeed a very useful tool to measure and analyze data. It’s a software which is useful for data analysis. All activities of the visitors to the website will be analyzed within seconds. The behavior of the visitor and site activity will be given in a simple way which is understandable even by people who have no technical knowledge. It’s a tool used to analyze data, which provides demographic data and category interests. Data can be analyzed using segmentation tools. A Yahoo Web Analytics account has to be set up first to use this tool. It’s analytics software which has tools like Heatmap to mark important areas, Scrollmap to figure out which part is working, an overlay tool, and a Confetti tool which provides details of what visitors are doing on the web site. It also offers a free trial of 30 days. It provides information about the way one can succeed by analyzing data. It also provides the demographic data which helps one to gauge the competitors. This also provides information about which keyword is drawing traffic to the website. It’s a web analytics software which gives results instantly in a hassle-free manner, just by copying and pasting, without any need for coding. It provides an user-friendly interface which helps in conducting tests easily; also has HTML and JS editor for experts. 4QSuite is a analytical tool which gathers information from the visitors to a particular website and helps evaluate customer satisfaction. The feedback of the visitors can be used to improve the traffic to the website. The setup takes just a few minutes. A free trial of the software is available. Information about every click is provided by Clicktale along with the way visitors navigate the site. Additionally, Clicktale has conversion funnels to get better conversion rates. TraceMyIP is another software which helps in getting information about visitors in real time. It also provides keywords on which search is conducted by visitors. All information about visitors like activity, visiting frequency, location of visitor and IP address statistics of the visitor is tracked. It’s a social networking analytics software which offers various metrics to opt for and one can choose the metrics suitable for them. It provides details of visitors to a site and their IP address. In current web dominated world, it will be a big mistake to not have a good understanding of usage pattern of your website visitors. A good analysis can lead to great navigation and really user friendly websites. Worlds best business on web have dedicated web analytics team that are understanding user behavior and optimizing on regular basis. 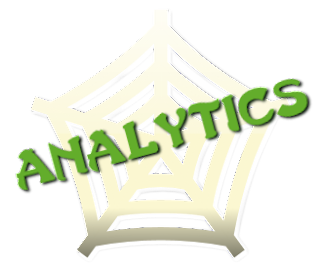 Can you think of any other website analysis tools that we have not covered in this list and you found really useful. Feel free to share with us. Based on the outcomes of ’the most used Web Statistics reports’ utilization research – one can determine that there is an progress towards less use of conventional reviews for the innovative Web Statistics individual. Actually to the level where 1 in 10 reviews asked for by a innovative web analytics individual is not offered out of the box from the web analytics vendor.I desired to discover out if there was a different utilization routine between innovative web statistics customers and less innovative web statistics customers, and if so, what reviews one would enhance to. This is quite an huge list to check the traffic for my website, still yet I have not used any tool other than Google Analytics but now would love to give try to others too to check whether they can provide better results than Google Analytics.